Swingin’ it and swingin’ it and swingin’ it well….. Please welcome Doug to the family. Cross-training is typically defined as participating in multiple sports. At CrossFit we take a much broader view of the term. We view cross training as exceeding the normal parameters of the regular demands of your sport or training. 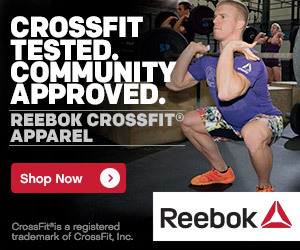 The CrossFit Program recognizes functional, metabolic, and modal cross training. That is we regularly train past the normal motions, metabolic pathways, and modes or sports common to the athlete’s sport or exercise regimen. We are unique and again distinctive to the extent that we adhere to and program within this context. If you remember the CrossFit objective of providing a broad based fitness that provides maximal competency in all adaptive capacities, cross training, or training outside of the athletes normal or regular demands is a given. The CrossFit coaching staff had long ago noticed that athletes are weakest at the margins of their exposure for almost every measurable parameter. For instance, if you only cycle between five to seven miles at each training effort you will test weak at less than five and greater than seven miles. This is true for range of motion, load, rest, intensity, and power, etc.. The CrossFit workouts are engineered to expand the margins of exposure as broad as function and capacity will allow. —courtesy of CrossFit, Inc. Previous PostThursday, December 2, 2010Next PostCyclocross Race!! Great to see you Amy & Tyler! It was wonderful getting to hang out and chit chat! especially after the row, thanks for not setting me loose on the streets of Junction with my head all dizzy still! What a nice little gym y’all have created up there, it has really good energy! as for me: 2K row on C2 machine 7:06.1. hope to see you guys soon!